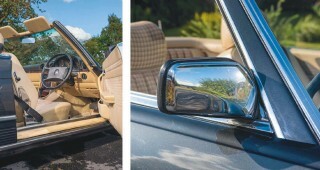 The R107 is looking better by the year, and this 1988 Mercedes-Benz 300SL R107 is pristine perfection. Words Emma Woodcock. Photography Dan Sherwood. Pushing up and over, the bonnet bulges forward, urging over the headlights. Wedged with lumps of chiselled orange, the glass rhombuses have plenty of moxie themselves, crammed hard up against the horizontal swellings of the radiator grille. Bang in the middle, pinstriped with a single line of chrome, stands the oversize marque roundel. Any astute observer knows we can only be talking about the R107! Economical yet defiantly masculine, the third generation Sport Leicht remains an iconic automotive design. Look a little closer and you’ll see the Mercedes we’ve come to enjoy on a chilly day in Cheshire is a late production model. It was first registered in December 1988, to be precise. The tell-tales are subtle, but they’re there. The bumpers suggest it, complete with the deep front lip spoiler. Those uncluttered alloys are also a giveaway and, if you really know what you’re looking for, the door handles will contradict any attempt to disguise the age of the car. Yep, the 300 SL sitting before us is an almost original survivor bearing testament to an era when our favourite manufacturer perfected the art of capability without clutter. Following careful renovation, this pristine R107 is ready to take us all around the world, and with good reason. 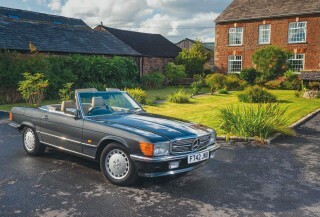 When the four-seat drop-top first hit the open road exactly three decades ago, rising soul star, Lisa Stansfield, was behind the wheel. Or, at least, that’s what several people who have worked on the car – or have been lucky enough to own this particular Mercedes – have told us. Evidence is scant, but teasers are present. 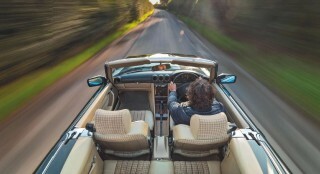 Paul Dey (the classic car nut who recently recommissioned this stunning SL) shows us the way. “Follow the trail and the story makes sense,” he suggests, pointing to an original dealer sticker from a Mercedes merchant in Manchester, a city close to Stansfield’s native Rochdale. There’s also paperwork highlighting the car’s export to Ireland, where the singer lived for a number of years. Of course, we invited her to tell us about this deep grey SL’s early life, but at the time of writing, we’re still waiting for a reply. Perhaps she's still out looking for her baby? Several decades after it was first released into the wild, the car found itself under the guardianship of a dedicated enthusiast and amateur restorer. Sharing garage space with a chrome-grilled 230 CE and a 1970s Fiat 124 Spider, the future for this magnificent Mercedes looked promising. Half-stripped, the car was ready for a full recommission, but tragedy struck when its owner unexpectedly passed away. His three classic cruisers were sold to Paul in 2016. Though the circumstances were undesirable, Paul was perfectly placed to be the SL’s new keeper. As proprietor of Altrincham-based car dealer, Dey Motor Company, and a lifelong petrolhead, he adores any interesting automobile and has owned a high number of desirable machines made by Mercedes. His love of the marque started in his teens, when he was exposed to the 300 SEL owned by his friend’s father. Eventually, Paul was in a position to buy a Mercedes of his own. “It was a W201 190E registered in the early 1990s,” he tells us. “The car was just two years old when I bought it from the finance director of a local golf and country club.” Painted black, well specified and fitted with oversized alloys, the fast four-door remained with its new owner for two years until it was replaced by a CL 600 Lorinser. A 500 SL and a C63 AMG DR520 followed. When the 300 SL seen here landed at Paul’s workshop, the car wasn’t running and much of its componentry was being stored in boxes. Thankfully, an inspection delivered positive results, confirming excellent overall condition bolstered by no more than 48,000 genuine miles. The bodywork was unsullied, with corrosion only affecting one of the front wings. A replacement panel quickly solved the problem, allowing the car to be on the receiving end of a full respray soon after. Glittering and multitonal, the finish proves grey needn’t be synonymous with boring. It also takes years off the R107. There was no way Paul’s team was going to stop there, though. Fresh paint demanded details to match. Renewed rubbers and brand new exterior brightwork was supplied by The SL Shop, while the fifteen-inch alloys were stripped and powdercoated by The Wheel Specialist in Manchester. The flat faces are protected by fresh tyres in the original 206/65/15 profile. Inside, preservation was the key focus while working on the cream-beige, part-cloth interior. “It was in fairly good condition when I bought the car,” says Paul. Nevertheless, the door cards and floor mats both demanded replacement. With the exception of these parts and a little reassembly here and there, the cabin otherwise remains untouched. Each luxuriant inch of sunny leather and polished wood barely shows a tenth of its age, creating a 1980s timewarp only a modern Pioneer head unit dares to disrupt. 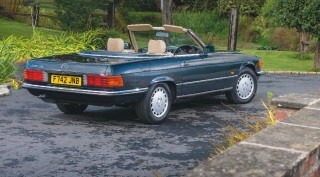 After six months of unrushed work, and with most of the car’s original equipment still in place, the great grey drop-top stood as a testament to enduring Mercedes build quality. Paul was ready to hit the road. “I finished the recommissioning work, drove the car for a short while and then received a request from one of my clients asking if he could be the SL’s next owner. I hadn’t even found time to compile the history folder!” The R107’s admirer was Neil Macleod, founder of bar and restaurant chain, Vodka Republic, and owner of Manchester’s first Bohemian bierkeller, Alberts Schloss. “He was on the hunt for a usable classic. If you’re not in a rush to get anywhere fast, a 300 SL fits the bill perfectly. This car pretty much drives itself!” grins Paul. We can see why Neil was so keen. Pristine and trouble-free, motoring in a modern classic doesn’t get much easier. Worst thing about your R107 300 SL Don’t ever take the springs off the boot lid! Introduced in 1985 and produced until the R129's arrival in 1989, the 300 SL might not have had the twist of its benteight siblings, but it's every bit as desirable today. Powered by a smooth and reliable M103 straight-six, the model picked up where the older 280 left off, benefitting from a number of facelift enhancements. Key changes include firmer suspension, a pronounced lip spoiler, heated door mirrors and a redesigned steering rack. Together with the friendly nature of the torquey sixcylinder engine, the result is a thoroughly usable modern classic. Left Straight-six boasts low miles, indicating Stansfield found her baby much quicker than anticipated. Above and below Gorgeous grey paired with cream interior takes years off the R107.